The Grinnell Giggers were from the area around the Missouri-Arkansas bootheel, near an inlet from the Mississippi River named Big Lake. In fact, the band took its name from a type of fishing done in the area; in the spring of the year, the river would flood, leaving large ponds of backwater. Locals would find in these pools a “trash fish” called grinnel, and they would catch them with old-time three-pronged forks — a practice known as gigging. The term “grinnel giggers” was thus a phrase that had about the same meaning as “Skillet Lickers.” It was not an image, though; most members of the band were cotton farmers and fishermen who had actually done such gigging. The band’s leader was fiddler Ben Tinnon, who had been born in 1891 in the hamlet of Holcomb in New Madrid County, nor far from where the great earthquake of 1811 took place. (Actually, there were two Ben Tinnons, Ben senior and a cousin called “Little Ben”.) 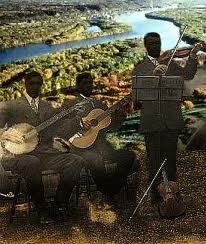 Ben senior was a country fiddler who played for local dances and also worked on and repaired fiddles. By the time he made his recordings in Memphis in May 1930, he was living in a town called Minilla, in the Missouri bootheel; the family often moved back and forth across the Arkansas-Missouri line. The Memphis session — the only time this band recorded — yielded eight sides, most of them originals composed by Tinnon. They were “modern” enough that they stayed in print for years, and some, like “Plow Boy Hop,” became favorites of later traditional fiddlers. “Ruth’s Rag” was named after Ben’s wife, who was a legendary buck dancer in the area. 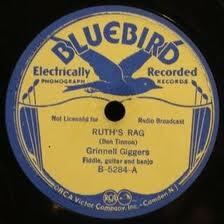 Other members of the recording band included Melvin Paul on banjo and Grover Grant on guitar. Tinnon also trained numerous family members in his music; one nephew, Mayfield Tinnon, became good enough to appear on “Major Bowes Original Amateur Hour,” wrote a popular song called “Popcorn Boogie,” and eventually tried his luck, without success, in Nashville. Ben died in East Prairie in 1975.